WestJet's 2017 Christmas Miracle Video is Here! WestJet released their 2017 Christmas Miracle Video December 11. It’s here. WestJet’s annual Christmas Miracle video is one to remember. The company’s annual Christmas Miracle video this season is WestJet’s 12 Flights of Christmas and recalls the wonder and joy of holiday celebration through the eyes of kids from Boys and Girls Clubs of Canada. "WestJet creates holiday magic for Canadians every year. This year, we asked for help from youth from St. Alban's Boys and Girls Club," said Richard Bartrem, WestJet Vice-President Marketing Communications. "Christmas, through the eyes of a child, is magical and the children gave us wonderful inspiration for surprising our guests. The best part was that the children got to be present to witness their own miracle come to life." "Boys and Girls Clubs of Canada and WestJet Cares for Kids share the same goal: making the impossible possible," said Mathieu Chantelois, VP of Marketing & Development, Boys and Girls Clubs of Canada. "For the last ten years, WestJetters have gone above and beyond to support our Clubs and our communities and we can't think of a better way to celebrate. We are proud to be a part of their 12 Flights of Christmas video and we look forward to the future of our partnership." WestJet Cares for Kids and Boys and Girls Clubs across Canada are sharing the video to inspire Canadians to support their local club. 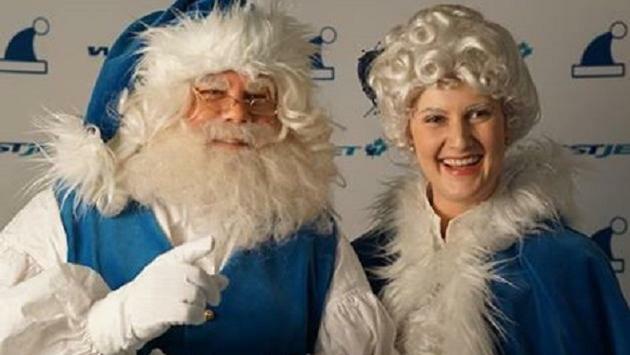 The video is a compilation of a dozen flights broadcast to Facebook Live, with guests ranging “Blue Santa” to Mrs. Claus and celebrity guests ranging from sports stars to Peter Mansbridge “spreading love and cheer” to hundreds of WestJet guests. It’s a lively and touching video and a tribute to the power of giving and the spirit of Christmas.